Hello and welcome back to another update of Forgotten Hope. Today we have a quick reminder about voting for FH2 in the Mod of the Year contest, and an announcement about the upcoming Nations Cup, hosted by Forgotten Honor. Before all of that, the team would like to thank everyone for participating in the recent FH Game Night. We hope you all had fun hunting the deadly "Warbear"! We would also like to remind everyone that phase one of voting for the 2010 Mod of the Year competition is still going on. Remember, help make FH2 one of the top 10 mods of this year's MOTY, and as a reward, a very special announcement will be made. You can click on the MOTY logo above to vote for Forgotten Hope 2. After the success of the Nations Cup last year we were asked many times if there would be a new edition of the Nations Cup in 2010. Immediately we started organizing and planning a new event. And now we are back with the 2nd edition of the Nations Cup on the 10th, 11th and the 12th of December! This year the Nations Cup is even bigger, stronger and better. With Forgotten Hope 2, players of all nationalities will be playing together in teamwork based squads in a 3-day tournament-style competition. We can ensure you that you will see a lot of action. The Nations Cup 2010 is a competition for the Forgotten Hope 2 mod for Battlefield 2. The main objective of this event is to have each national team fight against each other until we have a final and decisive winner. Pressing the button below will link you to the platform being used for the Nations Cup 2010 at www.forgottenhonor.com. If you are not registered yet, you will be asked to register on the website first before you go further. As soon you are registered you will see a list of several tournaments that Forgotten Honor is hosting. Search for the Nations Cup 2010 tournament and hit 'Start Registration'. There you choose the Unassigned Participants. After you are done you will see the Nations Cup 2010 forums, there you will find the How to Sign-Up post where you can sign up for a team. Hello and welcome back to another update of Forgotten Hope. In addition to a brand new German tank-destroyer, we also have two very special announcements relating to FH2. As many of you are already aware, the 2010 Mod of the Year competition has started. As such, we hope that everyone takes the time to log in and vote for FH2. However this year, we've decided to do things a little differently, and offer you, the community a challenge. Help spread the word about the mod by voting for Forgotten Hope 2 in phase two of this year's MOTY competition. Should FH2 win one of the top 10 spots, a very special announcement will be made in the following weeks, relating to the future of FH2, as thanks to you, the players for your continuing support to FH2. You can click on the MOTY logo above to vote. Now on to the actual update. Today we are showing off the German Jagdpanzer 38(t) 'Hetzer', one of the most common late-war German tank-destroyers. 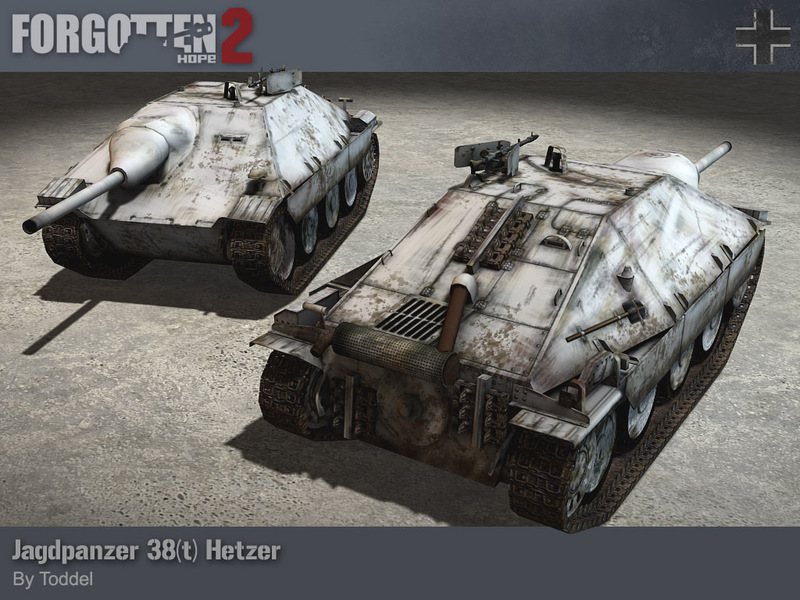 The Hetzer was a true step above some of its earlier predecessors like the Marder series. The fully-enclosed hull made it much safer to operate for the tank crews, and the sloped armor gave it overall better protection. The Hetzer was also able to avoid the mechanical problems of some of the larger tank-destroyers by using the already proven Panzer 38(t) chassis. The small size of the vehicle was both good and bad however. In the field, the Hetzer could be easily concealed and knock out Allied tanks at range using a modified 75mm gun, but at the same time, the small size forced the crew to work in cramped quarters. Other problems included poor visibility and a limited gun traverse. 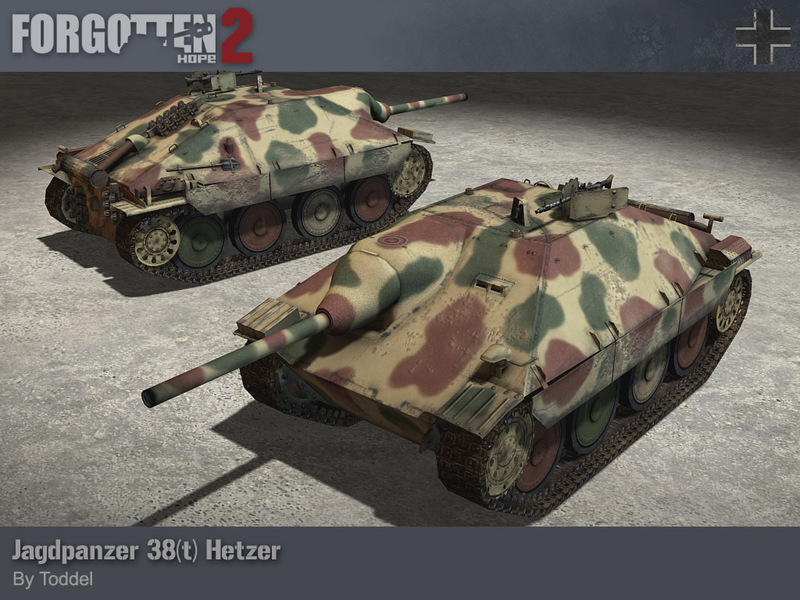 Between 1944 and 1945, approximately 2827 Hetzers were produced. The Jagdpanzer 38(t) Hetzer was made by Toddel. Last but not least, we have some more information regarding FH Game Night #11. You can view the announcement poster below and click on it for more details. 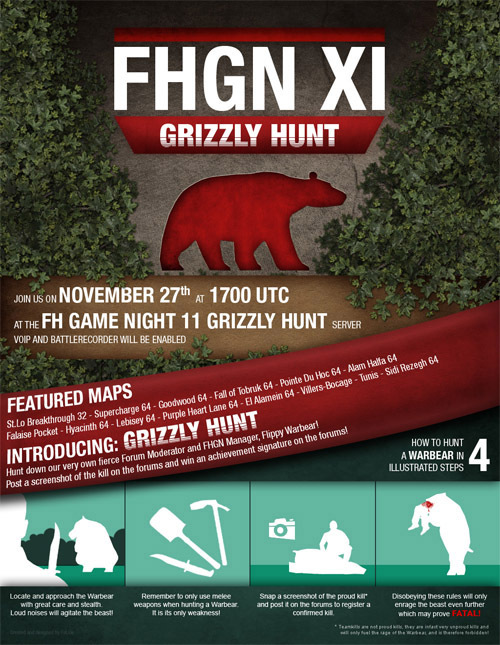 A big 'thank you' to developer FatJoe for this excellent poster and betatester Flippy Warbear for organizing the whole event. See you there! Hello and welcome back to another update of Forgotten Hope. Today, we have two tanks that have been re-outfitted and re-painted for use in the snowy conditions of the Ardenne. Up first we have the M4A3 Sherman, painted in the whitewash camouflage scheme that was common amongst US Army vehicles during the Battle of the Bulge. By the time the Battle of the Bulge had started, the M4A3 was the main Sherman variant currently in use by the US Army. For obvious reasons, tanks could not be brought back to the factories to be re-painted. Instead they were painted in the field in a camouflage pattern called whitewash. Rather than be an even, pure white coat of paint, the tanks were painted unevenly. Combined with paint that chipped easily, this created a camouflage effect that actually worked better in snowy conditions, and thus allowed the M4A3 to serve with distinction throughout the entirety of the Battle of the Bulge. 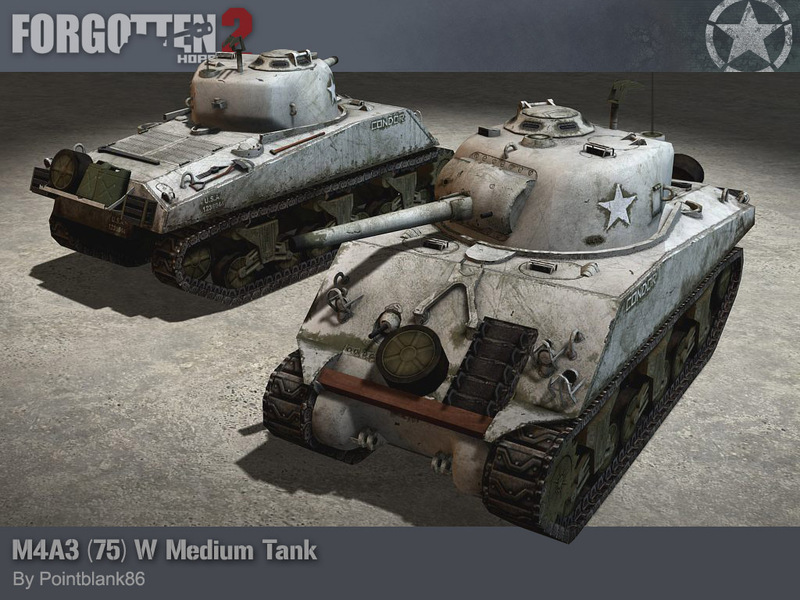 The M4A3 Sherman was made by Pointblank86. 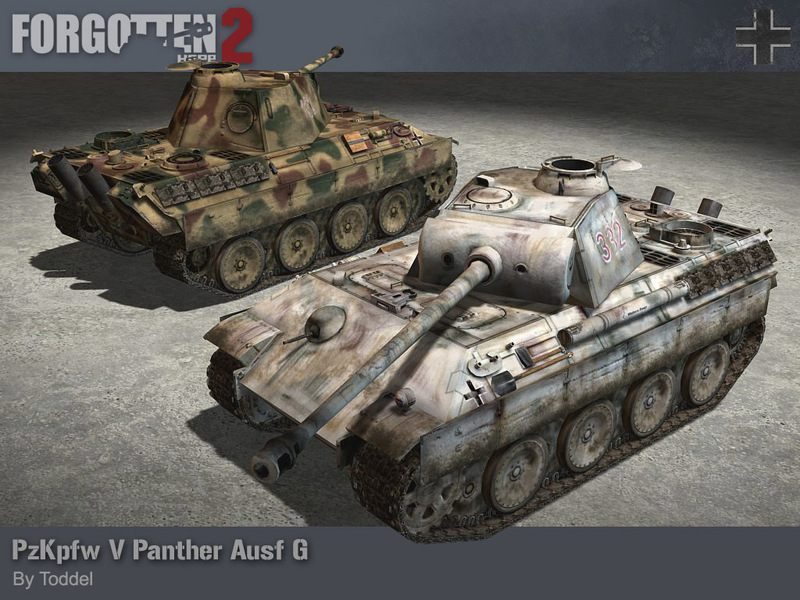 Up next we have the mighty German Panther G medium tank, re-painted to be used in the Battle of the Bulge. Although the Panther G already saw action in Normandy, it was not the same tank that was used in Belgium. Although it looked relatively the same, the tank received a new gun mask, air filter, and muffler. As well as a new paint scheme. A status report the day before the offensive started reported that a record high of 471 Panthers assigned to the West front. Out of that, 336, or 71% were operational. Once again, the Panther demonstrated its ability to knock out enemy tanks at long range in open combat. However, it was still prone to heavy losses in close-quarters fighting. One famous incident involving the Panther was Operation Greif, where they were disguised to look like M10 tanks. These Panthers were easily discovered and destroyed however. The Panther G was made by Toddel. Finally, we have a quick announcement regarding the upcoming game night for FH2. On Saturday, November 27th, the FH2 team will be hosting its 11th FH Game Night. Come and enjoy a night of relaxed FH2 fun with fellow gamers, betatesters, and developers. Stay tuned to our public forums for more information.